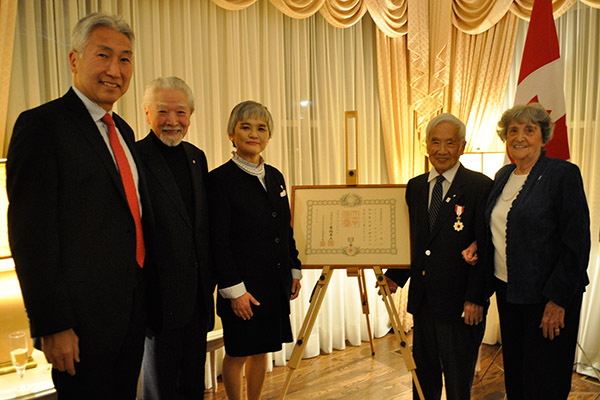 TORONTO — On Jan. 11, Nisei Frank Moritsugu was awarded the Order of the Rising Sun, Gold and Silver Rays in recognition of his work in the Japanese Canadian community as an accomplished journalist, judoka and human rights activist. 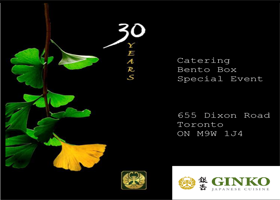 In a ceremony at her official residence, Consul-General of Japan in Toronto Takako Ito conferred the Government of Japan award on Moritsugu. Present were many members of his family and friends. The Consul-General spoke about the Japanese Canadian community’s resilience and courage through the hardships suffered before, during and after the Second World War, and how Moritsugu has exemplified those qualities throughout his life. Frank Moritsugu and Consul General of Japan in Toronto Takako Ito. 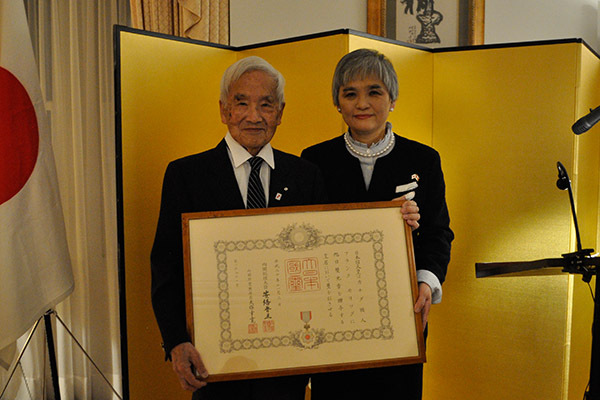 Moritsugu has played vital roles in pivotal moments in Japanese Canadian history. 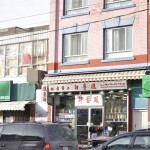 During the redress movement in the 1980s, Moritsugu was part of Sodan-Kai, which informed the Toronto-area Japanese Canadians on the progress of the movement. He chaired meetings and wrote campaign newsletters. He also helped organize and took part in the redress rally of April 1988 at Parliament Hill in Ottawa. In his retirement in 1989, his writing and lectures continued advocating social justice. 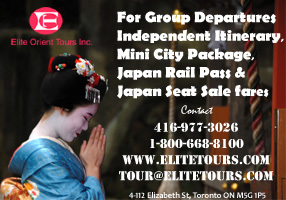 Moritsugu has visited and lectured in schools and organizations like service clubs across the GTA about Japanese Canadian prewar and wartime history. A Second World War veteran, he served overseas as a sergeant in the Canadian Army Intelligence Corps, attached to the British forces in Southeast Asia. Frank gives a speech during the conferment ceremony. 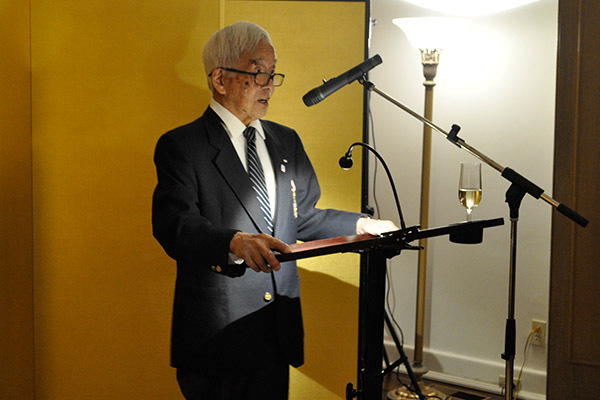 While Moritsugu has slowed down on his lectures—he is 96 years old now—he still makes the effort to speak at his grandchildren’s schools about his internment and wartime experiences. His talks emphasize the point that such a thing should never again happen in Canada. “Mr. Moritsugu is a senpai to all of us in the community,” said Gary Kawaguchi, president of the Japanese Canadian Cultural Centre, who was invited to toast him. 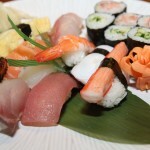 “Seeing Mr. Moritsugu’s byline in the Toronto Star back in the 1960s meant much more in an aspirational sense. It meant that in a sea of uniformity where we stood out, it was okay to reach higher,” said Kawaguchi. Moritsugu’s journalism career began in 1940 as editor-in-chief of Kitsilano High School Life, his school’s monthly newspaper. 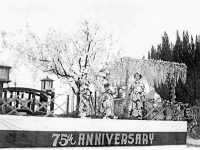 He began working at The New Canadian on Dec. 15, 1941, just eight days after the bombing of Pearl Harbor, the only Japanese Canadian paper allowed and was publishing three times a week. Under censorship by the Canadian government, the paper informed Japanese Canadians on the confiscations and changes in Vancouver during a time of upheaval. During those B.C. years, despite his newspaper experiences Moritsugu never thought it was possible to become a mainstream media journalist because of his heritage. In those days, names like his were never seen as bylines. 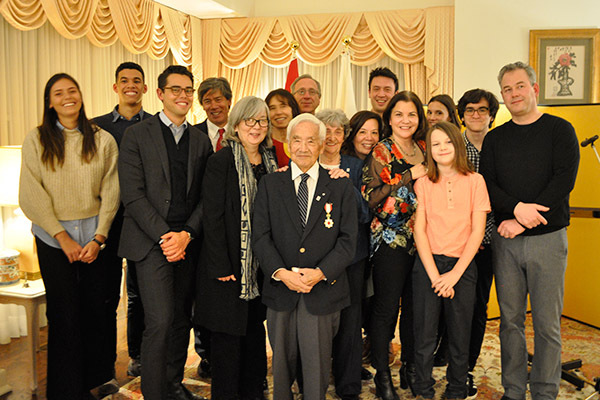 Frank Moritsugu and his family at the ceremony at the Consul-General’s residence in Toronto. In 1946, after the war and living in Ontario, he had an article published in Saturday Night, one of Canada’s oldest (ceased publication in 2005) and respected general interest magazines. The article, Why the Japanese are against moving East, explored why several thousand persons remained in the B.C. interior although the detention and work camps had been closed. That accomplishment was by a high school graduate who had only written and edited in an ethnic community paper before. 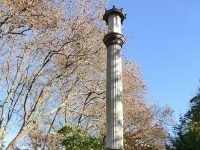 Instead of using the veterans’ benefit to go to the Ontario College of Art (he had also been the school cartoonist at Kitsilano High), he took the advice from former English teacher, Jean Story, and Saturday Night editor, Dr. Sandwell, to become a mainstream journalist, his first dream. 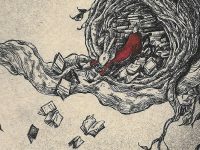 Moritsugu studied at the University of Toronto and went on to write for several publications in Toronto, Vancouver and Montreal— Maclean’s, CBC Radio News, the Toronto Star, and the Montreal Star. He was the first non-Caucasian editor-in-chief at the University of Toronto’s campus paper, The Varsity, where he won the Canadian University Press Best Editorial award in 1951. That led to a job at Maclean’s which was packed with features about things Canadian. His journalism career continues today, where he still contributes monthly columns to Nikkei Voice. Upon graduation, Moritsugu also returned to judo and became an accomplished judoka, on the tatami and in organizational politics. In postwar years, he helped to establish Judo Canada, and in 1982 was chosen as a life member of the organization. 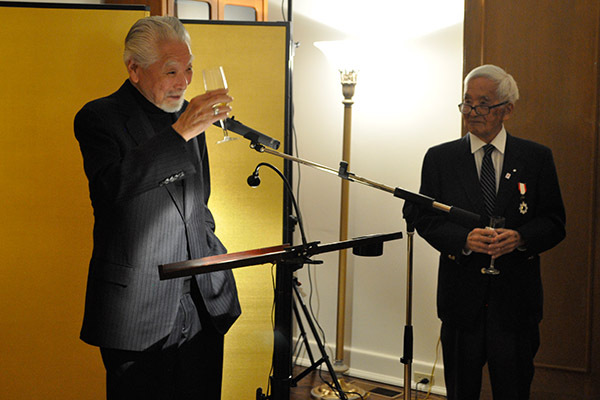 Architect Raymond Moriyama toasts to Frank Moritsugu during the conferment ceremony. Also speaking at the award ceremony was renowned architect Raymond Moriyama. He spoke of their 40-year friendship, and Moritsugu’s ability to always push people to be better. “Frank, you’re a great friend, and a great friend of the Japanese Canadian community, and also for Canada as a whole,” said Moriyama. For all his accomplishments, Frank made sure to thank his wife Betty, without whom, he says none of this would be possible.